Our goal is to raise funds to provide and support assemblies, activities and events for students at SOMS. Need another excuse to Wear your Halloween Costume? Join us for this family friendly fitness event. Everyone is encouraged to wear costumes while running the course. Halloween music and activities will be provided for all. No Refunds. Event will be held rain or shine. Late Registration is now open for limited spots. We can’t guarantee shirts but we can guarantee fun! *** If doing the Family Participation package please fill out below form for every runner! To join our T-shirt Sponsor Program: Your donation for our sponsor T-shirt program is tax-deductible (#13-3061623). In exchange for your donation of $125.00, your company name will be listed on the back of the T-Shirt distributed to all ‘SOCSD Halloween Fun Run!” participants, as well as appear on all of our social media platforms including Facebook, Twitter, and Instagram. If you wish to support us, please complete this form and return with a check made payable to SOMS PTA. 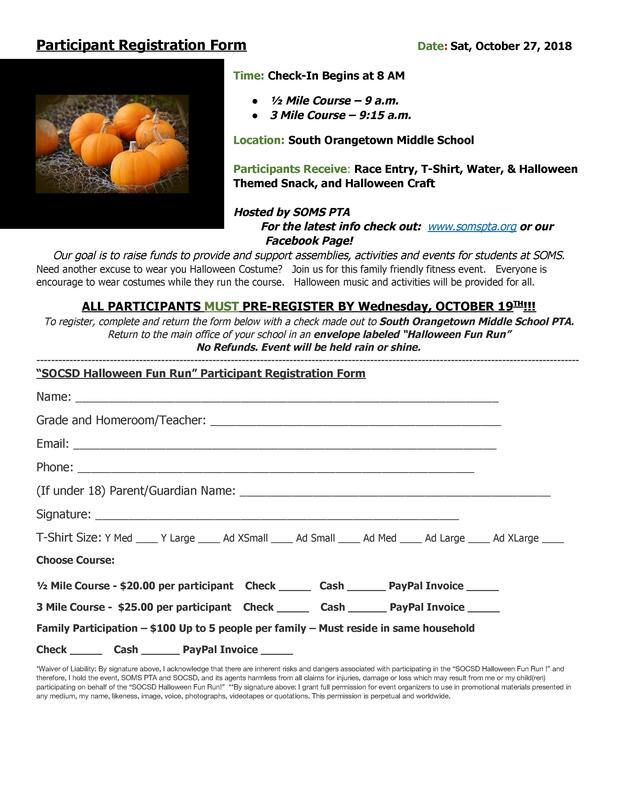 You can either mail to SOMS PTA – Halloween Fun Run, 160 Van Wyck Road, Blauvelt, NY 10913, or arrangements can be made to pick up in person. Thank you!